Tracy Abrahams : My Stampin' Up On Stage Live 2015 Swaps! Hi thanks for popping by to my blog today, as you read this post I am in Brussels attending the Stampin' Up! On Stage Live 2015. The On Stage Live event is an opportunity for all the Stampin' Up! demonstrators around the world to get together and see brand new products, learn about new tools, and see new techniques. To bring home and share with all their customers. We also do something called swaps where we all make cards or 3d projects and swap them with each other. This is my swap and I have made 75 of them to swap. 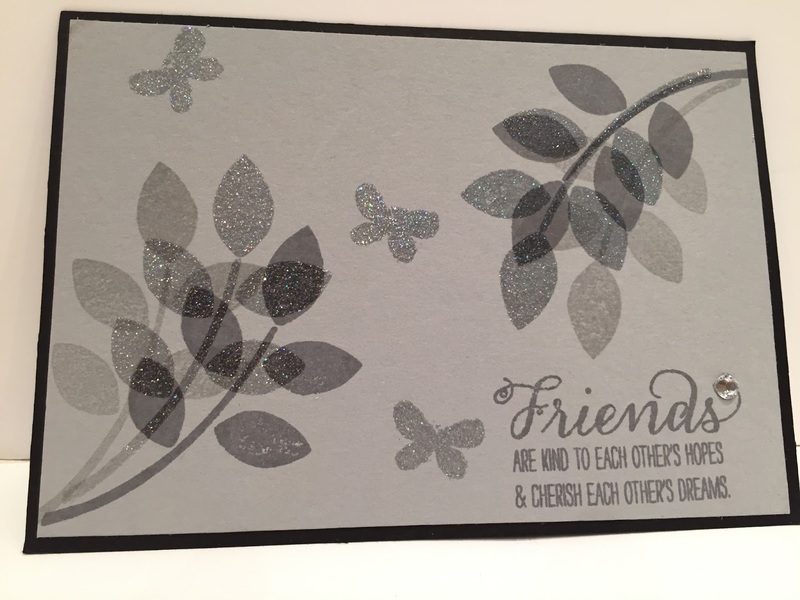 I made them using Basic Black and Smoky Slate Card card stock, Basic Grey and Smoky Slate ink and Iridescent Ice Embossing powder. I wanted something with a little sparkly and I think you can see that they do have some sparkle. I stamped the leaf from the Crazy about You stamp set first in the Basic Grey then in the Smoky Slate and then using VersaMark and a heat gun in Iridescent Embossing Powder. The little butterfly and the sentiment are from the stamp set Garden in Bloom. I'm so lucky to have the opportunity to work for such a great company doing something I love. I get to work with inspiring people who share their knowledge freely and see new products and enjoy the benefits of being a demonstrator. I love sharing and inspiring other ladies to create beautiful cards and projects as well as having the chance share my love of Stampin' Up! If you would like to make this lovely card and want to place an order your goods will be delivered straight to your door in only a few days. I have put all the products used in the table below. Just click the link to take a look. There is no obligation to buy. If you'd like your own paper copy of the Autumn/Winter catalogue or annual catalogue just let me know and I will send you out a copy FREE. Contact me at tamaraabrahams@hotmail.com. If you would like to become a demonstrator please go to my website at www.tracyabrahams.stampinup.net and take a look at the Joining Up section.